In his post for Entomology Today, gemologist Brian Berger shared pictures of an opal he bought during a trip to the Indonesian island of Java. Inside the crystal was an insect frozen in a dramatic pose. The specimen was examined by the Gemological Institute of America, a nonprofit research institute, which authenticated it as a real opal with a fossil inclusion. The fact that the insect was stuck within the crystal means that the opal itself isn’t just an opal, but opalized amber. Some trees exude a sticky sap that can immobilize bugs, leaves, seeds, and other ancient life forms. 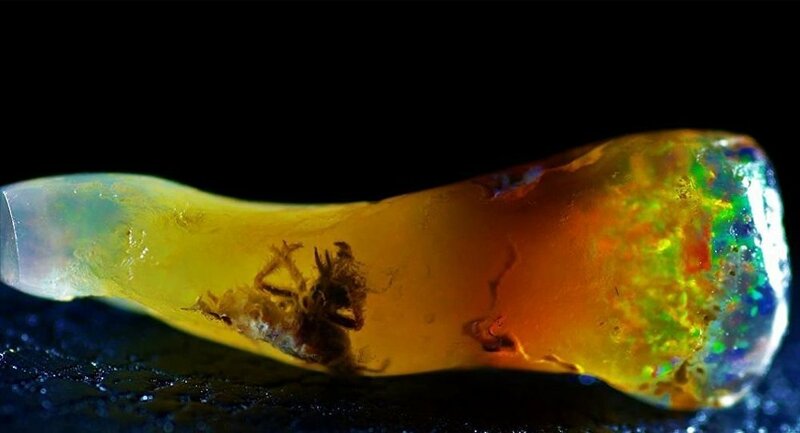 After being buried in the right sedimentary conditions, the sap transforms into a soft material called copal, and then, over the course of millions of years of underground pressure and heat it hardens into amber – a bright-yellow or orange stone, with an ancient lifeform inside. However, it is unusual for amber to become opal, as most of the Indonesian opals found are of volcanic origin. Opalization occurs when dissolved silicates are swept into cracks and cavities by water or other ground liquids, where they harden into opals, but amber located in the presence of hot siliceous fluids is extremely rare. “From a gemological standpoint, this is truly an exciting and extremely rare, notable find. And the same can likely be said from the entomological perspective,” Berger wrote. The opalization of the amber is only one of the theories, he noted, and he is hoping that in collaboration with other experts, including an expert on insect fossils, they would be able to investigate the insect inclusion further.